If there is one thing I love as much as cars, it's music. And I mean real music, from the good ol' days when a song had actual musical instruments, sensible lyrics and no Auto-Tune! So when I heard that Yngwie Malmsteen (one of the greatest guitarists in the world, in case you didn't know) was going to headline at the Orange Festival in Dambuk, I had to get there somehow! But Bert wasn't going to just let me saunter off from the office for a week when there was a ton of work to do for the year-end issue. That's when I had a light-bulb moment. Why not bring him along  on work, of course. Considering our work was to drive cars, it made it all the more easy to get him on board. If we were to get out of the office for that long, we needed something big planned  something bigger than just one car or one segment. 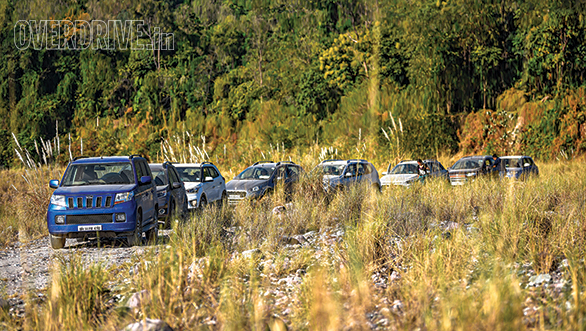 So just to be safe, we picked eight cars from three segments  the Maruti Vitara Brezza, Mahindra TUV300, and Ford EcoSport from the sub-four metre segment; the Hyundai Creta, Honda BR-V and Nissan Terrano representing the premium crossovers; and to make things more interesting, we also added two compact crossovers  the Hyundai i20 Active and the Fiat Avventura Urban Cross. Why all these cars, then? Because these already popular crossovers are only growing in strength, and it was time to put them to the test and find out how tough these pseudo-SUVs really are. The only issue, however, was convincing the manufacturers to give us their cars. The trouble here was that a Google search of the Orange Festival and Dambuk mostly resulted in images of a stranded bus that had tried crossing a river and trucks making their way across a rocky riverbed liberally sprinkled with boulders the size of watermelons. In no ways are we putting our cars through that kind of terrain, they said. So we lied. A big fat one, at that! We showed them images of the fantastic Asian Highway 1 and the NH15 and cajoled them into believing that the roads are smooth, well paved and built by the BRO. And so they reluctantly agreed. Well, we weren't completely lying. We were just, as I'd like to call it, not telling the whole truth. The road till Pasighat and the village of Siluk was fabulously paved. But only till there. Getting till Dambuk, well that's a whole other story. We ran through our checklist. Cars? Check. Challenging terrain? Check. Exotic location? Check. Malmsteen... I mean, storyline? Check, check. And last of all, we need a baseline one which to work all our tests. Since each car is mechanically different from one another, we needed a common thread that binds them together and lends a neutral and homogenous aspect to the tests. This is where tyres play a crucial role. CEAT Tyres in the last few years have been growing from strength to strength, thanks to better quality tyres that are equal to any other brand in the market. We needed durable, reliable and tough tyres that could handle the bashing, and CEAT Tyres have proved to be just what we needed in the past. We roped them in to give us that uniformity. So we fit every crossover with a fresh set of treads from CEAT Tyres. So safety? Check! We began our 660km journey from Guwahati in Assam rather late and considering it gets pitch dark in the North East by 5 pm, we halted at Tezpur just after crossing the Brahmaputra River. The next morning we were back on the road by 4 am, and the next thing you knew, the sun was peeping out from the horizon. I think it's high time India is split into two time zones! 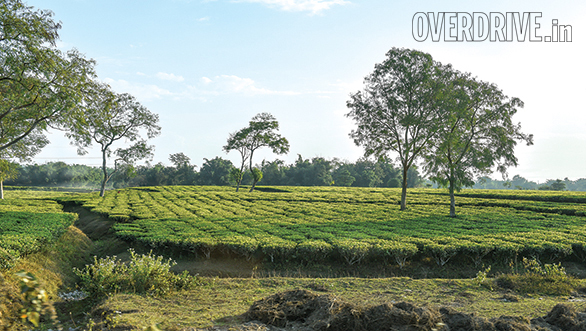 It was a spectacular sight watching it cast its light on the morning mist hanging low over the paddy fields. And I had a spectacular feeling with my windows rolled down and the song, 'Going Up The Country' by Canned Heat blaring from the speakers. It's this special feeling that I get when, as Canned Heat says, "I'm goin' to some place; I've never been before." 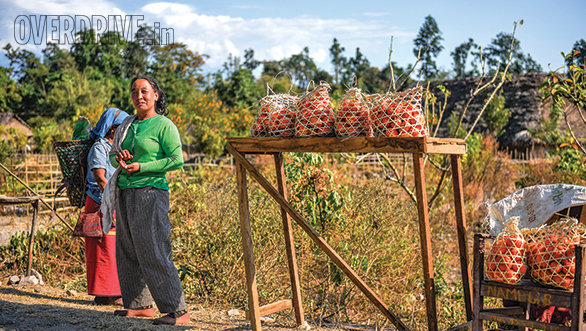 By the time we crossed over into Arunachal Pradesh and reached Pasighat, it was around 4.30 pm and almost dark. With a local lady warning us that all we'd find ahead was jungle, we tanked up and hit got back on the road. 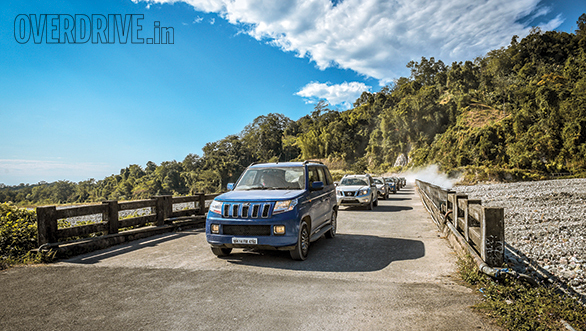 We had around two hours of driving to do, and the route from Pasighat was an empty, well-paved ghat section. Just when it seemed like the drive was finally getting over, roughly 45km ahead the highway just disappeared into a broken, single-lane road for a couple of kilometres. Soon we reached a boom barrier blocking the road. To the right was an eerie-looking dirt road going downhill and disappearing into the woods. It looked like the kind of road you shouldn't be driving down at night, but we had no other choice. Since I was a little ahead of the convoy, I was alone too. I put on my brave face and continued onward into the darkness until the forest opened up to the vast open space of dry, rocky riverbed. When we go on a drive as long and as trying as ours, only the safest and toughest set of tyres make the cut. 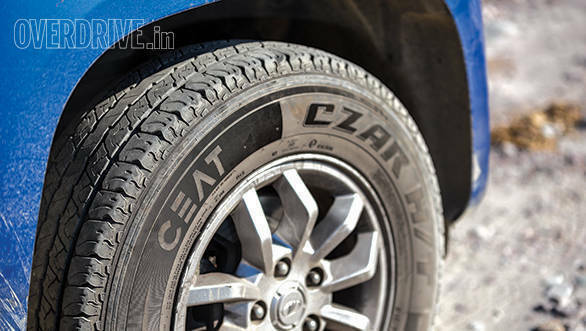 So we went to CEAT Tyres and got each of our cars a new set of Czar Sports or Gripp LNs. These tyres were awesome on the long smooth highways and the sweeping ghat sections, with plenty of grip at high speeds. Even when the roads literally disappeared close to Dambuk and we drove through the slippery and rocky terrain, they were impressively robust and grippy. Despite pushing the cars hard through punishing roads, we didn't face a single puncture. After about an hour of being bounced around in the car, I began to wonder if I had taken a wrong turn somewhere. Fortunately, I saw two motorcycles heading towards me. As I stuck my head out of the window and tried to flag them down, I saw what looked like deer antlers tied to the back of bike. For some reason I thought it was an animal head trophy like the ones you find at old resorts in the jungle, and continued waving at him and asking him for directions to Dambuk. He half-heartedly nodded in the direction I was pointing at and continued onward. Only then did I see that it was the head of a killed deer, still dripping blood. I immediately shoved my head back into the car and rolled my window up when the second motorcycle, carrying the rest of the deer  skinned and all  passed by. I quietly drove till the end of the riverbed, which wasn't very far off and decided to wait till the rest of the convoy caught up. Passing those hunters made it clear we were deep into the wilds of Arunachal Pradesh! Fortunately, the rest weren't too far behind and Dambuk wasn't too far ahead. We got there in time for dinner and were soon out cold in our cosy tents. We ate such good oranges in Dambuk that we had to bring some home! The next morning was an early one  or as early as our bodies would allow, at least. The sun revealed our beautiful campsite placed right next to the Dibang River, with mountains on one side and what seemed like endless flatland on the other. We set off towards the riverbed we came through to find a place to shoot photographs, when one of us  I won't say who (cough Alan cough)  got a bit over ambitious and tried to venture into the shallow water in the TUV300. 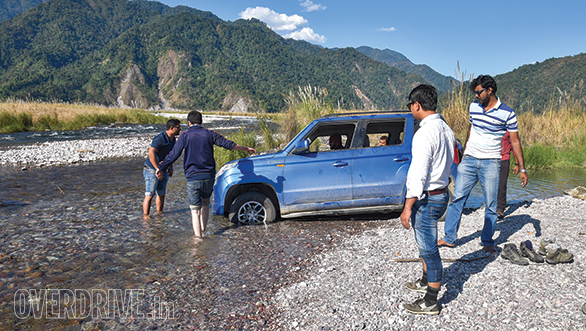 The sand and stones were so loose that as soon as the car entered the water, its tyre were half sunken in. Nothing we did could get the car out. Fortunately though, there was an off-road competition being held along with the Orange Festival. We managed to convince one of the marshals to come help us out with his 4X4 Maruti Gypsy. The surface was so loose that even the Gypsy began digging itself in when he tried pulling with a tow rope. It was starting to get late and we were worried we'd miss the one thing we came all this way to see  Malmsteen. Fortunately, the Gypsy was also equipped with a winch that slowly but effortlessly pulled the TUV out. We were free and we immediately went back to catch the concert. The team tried its luck at getting the TUV out. Needless to say, they didn't succeed. The venue had a lovely setting with the stage and stalls set on a paddy field surround by hills dotted with orange orchards. While we waited for the show to start, we found ourselves some delicious food  pork, chicken, chow mein and rice  prepared with that unique flavour that I can only describe as North Eastern. Eventually, the man of the hour emerged and immediately there was a quite a big crowd around the stage. In fact, even the chief minister of the state, Pema Khandu, was there just for the show. There isn't much else I can say to describe the show other than it being spectacular or amazing or mind-blowing. And even that doesn't do it justice. I never thought I'd be this happy to see a bare-chested man in a leather jacket and leather pants performing live on stage. Malmsteen is a thoroughbred old-school rock and roll musician right from the way he walks, talks and shreds his guitar. For someone who never thought he'd see an old-school performance like that, it was a real privilege to be there. He even played some BB King, which personally, was my favourite part of his show. Post the awesomeness that is Malmsteen, we headed back to camp both fulfilled and yet wanting more. We spent another day around the beautiful campsite and headed to the festival for the final night where we ate some more excellent local food and watched the local bands perform. 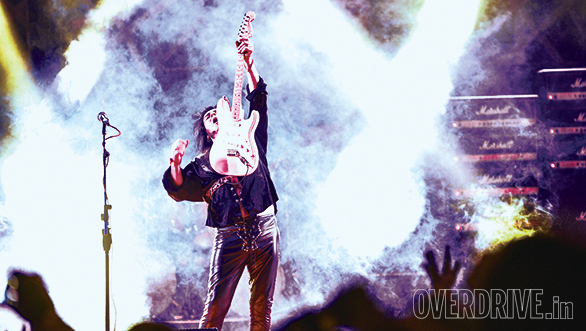 It was time to head back to Guwahati the next day and with the festival over, I could focus all my attention on the other half of my story  the cars. One of the Urban Cross' biggest strongholds is its design. 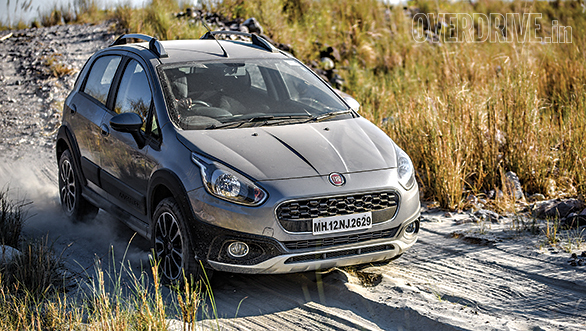 The standard Fiat Avventura, which this is based on, is a good-looking hatchback, and it only gets better with the rather inconvenient external tailgate gone. The interior is designed well too with quality materials and (finally) a touchscreen infotainment unit. While it isn't the best unit out there, it's still a great improvement from the outdated analogue system the Avventura was offered with until recently. Like the other Punto Evo-based crossovers, the Urban Cross' ride quality is quite impressive on the highway and on broken tarmac. It's got a good chassis too, making it a nice car to drive around in the twisties. On really rough terrain though, like on the 3km wide rocky riverbed, the car is too firm for comfort and you're thrown about in the car quite a bit. But then again, this car isn't designed for such terrain and it's quite impressive that it made it there and back without any problems or rattles, which goes to show its good build quality. 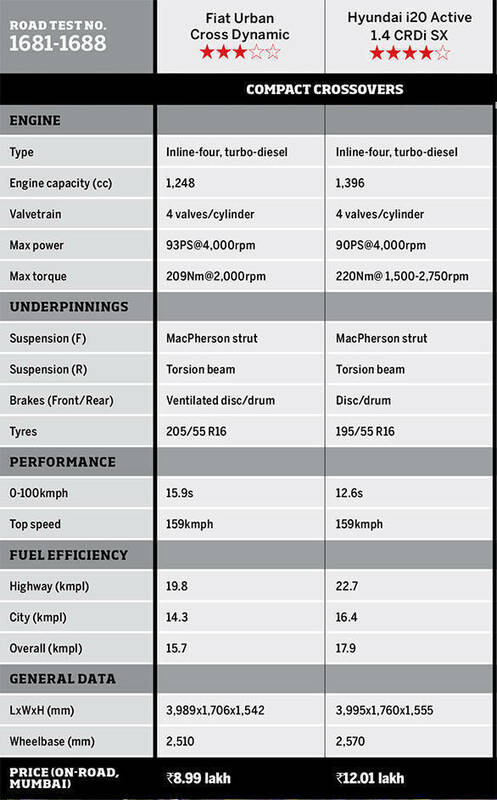 The 93PS 1.3-litre turbodiesel engine, however, is a bit of a let-down. It's practically the same engine as in the Brezza, but Maruti Suzuki has managed to get their tuning spot on! The Urban Cross' engine just doesn't feel very responsive, and I had to rev it all the way to the redline to get any performance out of it. And the rubbery 5-speed gearbox certainly doesn't help its case. But what really gets to me is the terrible seating position. The steering wheel is too far out and the pedals are set too far in, making it impossible to find the right position. So instead of having fun while driving in the ghats, I was too busy constantly adjusting my seat position hoping to find the right spot eventually. But I never did! 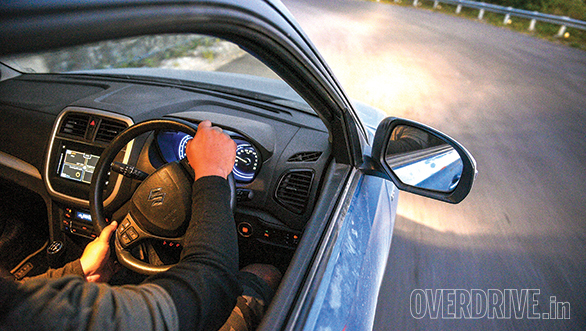 The i20 Active would have been the best driver's car hands down, if not for one flaw  the lifeless steering. Its smooth and refined 90PS 1.4-litre turbodiesel engine is very responsive with very linear power delivery. It has enough power almost anywhere in the rev range with its 220Nm of torque available right from 1,500-2,750rpm. The engine is quite free-revving too and will happily rev to the redline, if you want it to. Although, you don't really need to because of all the low-end grunt. The smooth 6-speed manual complements the engine very well, and the tall sixth gear makes highway cruising very comfortable. The suspension, which has been raised over the standard i20, feels a bit firm over larger bumps and sharp potholes. However, it does absorb the smaller undulations and keeps the car well planted on the highway at high speeds. The firm suspension also makes it thoroughly enjoyable to drive through winding roads. That said, the artificial-feeling steering is quite a killjoy! But like with the Urban Cross, the i20 Active wasn't designed to tackle very rough terrain. So over the rocky riverbed near Dambuk, it scrapes and gets uncomfortable to be in if you're not driving slow enough. This despite getting around 0.5cm of extra ground clearance from the larger CEAT tyres. And it's that slow progress that gets on your nerves more than anything else. On our way back to Guwahati, there were some unnerving squeaks and rattles coming from the front wheel. We had to nervously nurse the car back to Tezpur expecting something to break. 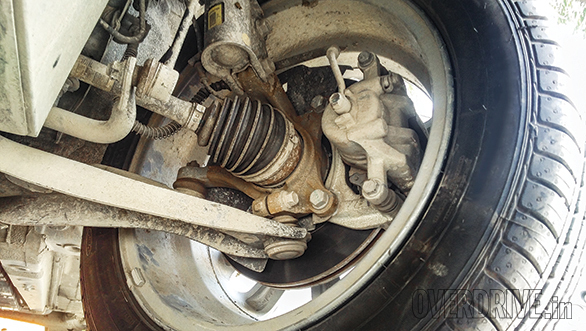 But after a visit to the service centre, we were told that it's just the brake calliper pins and suspension ball joints that needed to be greased after all the dust. It was a very quick fix which cost us just Rs 250. During the first half of our journey to Dambuk, from Tezpur to North Lakhimpur, the roads were in pretty bad shape with potholes and speed breakers scattered all over the place. Now this would have usually gotten me quite frustrated, but in the TUV300, I was thoroughly enjoying myself. The car feels almost unbreakable and happily absorbs any potholes you throw at it even at high speeds. The ride quality is really impressive in such sections. And that torquey engine makes it the next best thing to drive after an automatic, in terms of convenience. Simply slot it into fifth and it will happily chug along without complaint even at speeds as low as 40kmph! 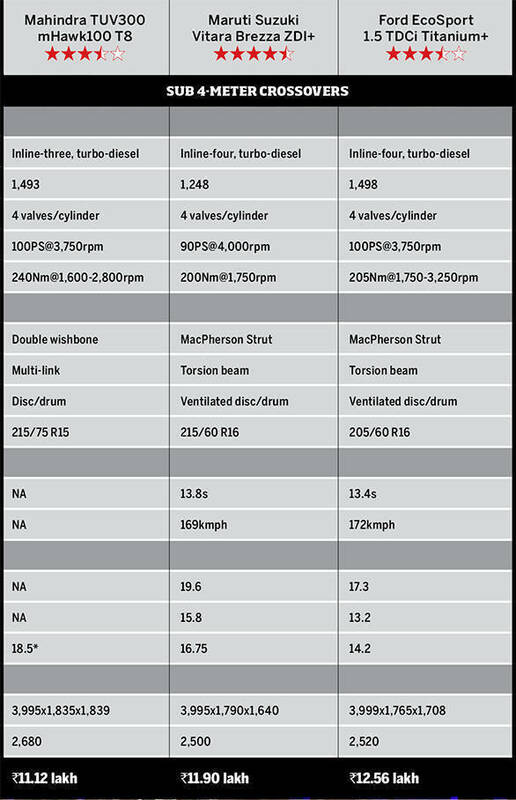 The 100PS 1.5-litre turbodiesel is impressively refined for a 3-cylinder unit, and what it loses out in top-end power, it makes up for with low-end grunt  thanks to shorter gearing and the 240Nm of torque that is available right from 1,600-2,800rpm. That said, it isn't the best car here for long drives on the highway. While the softer set-up is great if your daily commute involves driving through patchy roads and rough terrains, it makes the car quite bouncy and tiring to drive long distances on the highway. It's also skittish over unevenly paved roads at high speeds and makes the car feel unstable. The TUV300 is also a bit stiffly set-up, which translates to a fair amount of side-to-side movement which throws you around. But it's worth noting that it has been designed for rural areas where owners tend to overload the vehicles. In this case, stiffer suspension is necessary. It isn't too keen on taking corners at very high speeds either with a fair amount of body roll. The TUV300, in my opinion, is essentially a purpose-built car that is easy to drive around in the city and is as tough as nails to handle the rough terrain around your farmland. 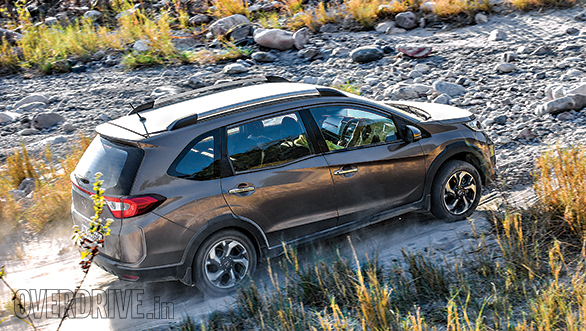 Off-road ability itself is decent as far as two-wheel drive vehicles go. But the rear-wheel drive TUV suffers from lack of traction. This is because, unlike all the front-wheel drive vehicles here, there isn't much weight over the driven wheels. This along with all that very torquey engine causes the wheels to spin up easily in first gear. What's also worth mentioning here is that Mahindra had sent this car to us all the way from Chennai. It was driven more than halfway across the country and even braved Cyclone Vardah in Andhra Pradesh. We then took it all the way to Dambuk and back without it being serviced, and still there were absolutely no issues with the car. The Brezza is probably the best and worst crossover here, depending on where you drive it. 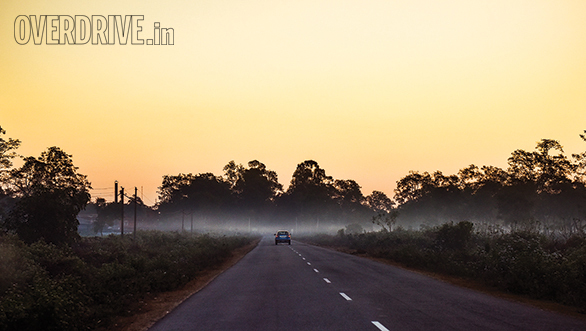 Give it smooth tarmac and winding roads, and I guarantee it will put a big smile on your face. It certainly did it for me! I'll admit that I wasn't very fond of its rough and slow-revving engine at first. But by the end of the drive, I simply couldn't get enough of it. Once I figured out how to extract maximum performance from the Brezza  and I did pretty quickly  it kept me very entertained! Of course, power delivery isn't very linear and all 200Nm of torque smacks you right in the face at 1,750rpm. But as long as I kept the engine in its power band, the Brezza would simply zip through all the traffic effortlessly. It's also a very good handler, and not just by crossover standards. Despite pushing quite hard around the ghat sections, the Brezza stayed flat with barely any body roll. That along with a precise, lively electric steering and a slick gearbox makes this an excellent driver's car. However, give it a smooth winding stretch of tarmac and we guarantee it will put a big smile on your face! Take away the smooth tarmac and you have a bit of a problem. While the car absorbs the smaller ruts and patches on the road well, the stiff suspension complains with loud thuds if you don't slow down over the sharper holes. While ground clearance was never a concern and the torquey engine made crawling over the rocks in first gear very easy, the Brezza was simply too firm to be enjoyable on such terrain. The Brezza feels like a car that's been designed specifically for road use with extra ground clearance to handle deep pot holes that we encounter oh-so-often in India. The EcoSport was the first successful crossover to come out in India in 2013. It was a great idea especially for our market, and all other manufacturers were probably slapping themselves for not coming up with it first. When it was launched, the EcoSport was quite a good car, but three years down the line, it's still unfortunately just stuck at not bad. While it did get an updated 100PS engine recently, the rest of the car, save for a few minor updates changes, is exactly the same. The centre console with its plethora of buttons and tiny screen looks and feels very outdated compared to the touchscreen on the Brezza and even the basic yet comparatively ergonomic infotainment unit on the TUV300. The EcoSport isn't very spacious either, and the all-black interior only makes it feel more cramped. However, I personally like this new engine because it's quite refined, while power delivery is linear and strong. But for some, like Rishaad, who is in love with the Brezza, the engine doesn't feel exciting or involving enough to be classified as fun. And that's something I understood only after driving the Brezza a bit more extensively. The EcoSport's handling isn't as sharp either. Although it does have good steering feel and response, it tends to roll or lean a little too much for comfort if you push it around corners. That said, it was certainly more comfortable than the Brezza over the broken roads  not as rugged or as fun as the TUV, but more comfortable than the Brezza. The softer suspension allows a bit more travel, which meant I wasn't bouncing around as much on the riverbed. However, if my daily commute involved dealing with such poor roads, the EcoSport still wouldn't make the cut. 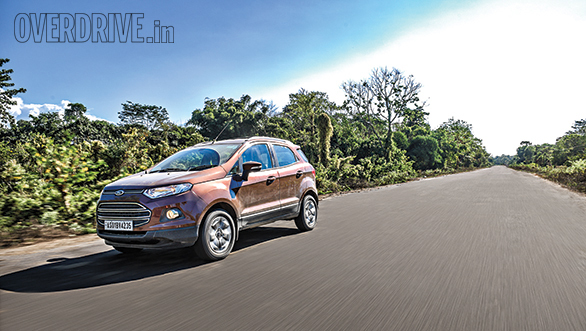 The EcoSport is neither a driver's car like the Brezza, nor is it meant to take on very rough terrain like the TUV300. It's stuck in a rather odd middle ground which, unfortunately, isn't very desireable. But then again, it's due for an update next year, and that could change its fortune. The BR-V is the latest entrant in the premium crossover and straight away it's got a couple of distinguishing features  it's offered with a CVT and it gets seven seats rather than the conventional five. While the TUV300 is technically a 7-seater too, the two jump seats in the boot are far from being comfortable enough to be considered as proper seats. They're not very safe either. The BR-V, on the other hand, has a proper third-row seat which can still accommodate two adults comfortably. The CVT, which gets paddle shifters with seven preset points, works well at lower revs and wasn't a bother at all while crawling over the rocky riverbed. The BR-V's suspension set-up meanwhile felt quite supple too, making the drive around the rough patches very comfortable even in the third row. While we were initially concerned about it scraping over the rocks because of its long wheelbase, it comfortably trundled along with any issues, even after losing around 0.5cm with a slightly smaller set of tyres. However, I did get this feeling that I would break something in the car if I pushed it too hard over broken roads. The BR-V is quite comfortable on the road too. However, it did seem a bit too soft to be pushed around corners and was a bit tiring to drive on the highway for longer periods because it didn't feel well-planted. Adding to its woes is the lack of underthigh support for the driver. The CVT makes power delivery very linear, but it also turns what initially seemed like a quite, refined petrol engine into a shouty, whiney one, when you step hard on the throttle. The BR-V's biggest let-down, however, are its features, or lack thereof. 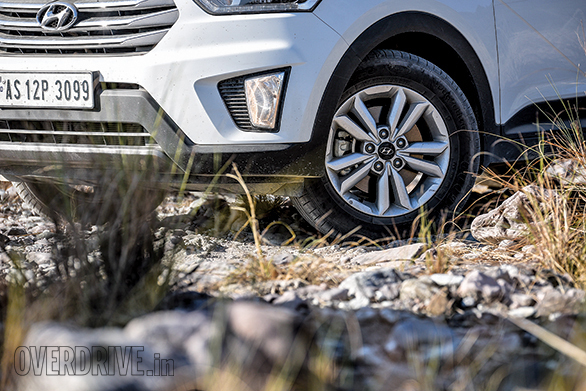 For a car competing against the well-equipped Creta, it's got the features of a car in a segment below. 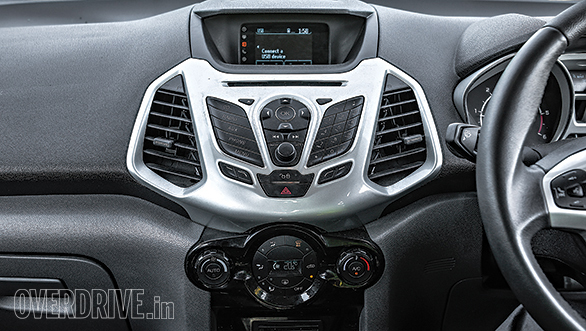 The centre console gets the same basic music system and climate control unit from the Honda Amaze instead of from the Jazz or City. But what really bugs me is the lack of parking sensors on a car this long! Overall, the BR-V is a really good family car for the city and for the occasional family holiday. But for the price you pay  Rs 14.67 lakh (on-road, Mumbai)  you certainly expect a decent amount of kit. If there was one car that is just right for India, it would have to be the Nissan Terrano, especially in its 110PS state of tune. It ticks all the right boxes. Is it comfortable? Check. Is it good on performance? Check. Does it handle well? Check. Can it take a beating? Double check! 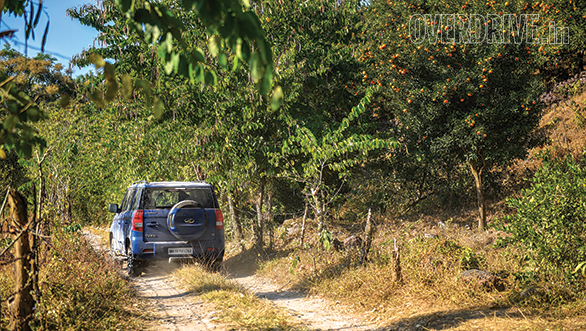 No matter the terrain, the Terrano simply charmed the socks off of anyone who drove it. On the highway, the refined 1.5-litre engine is impressively linear with barely any turbo lag, making for a very smooth drive. It's very torquey too, so constant downshifting isn't necessary. 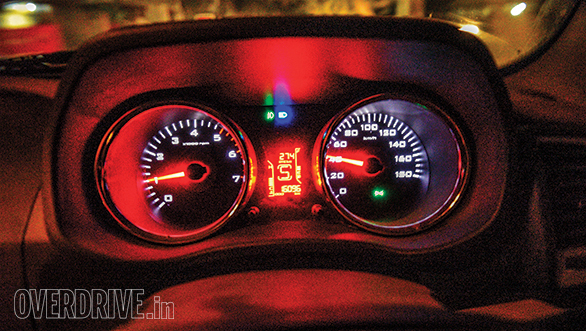 The tall sixth gear, on the other hand, not only makes it a comfortable cruiser but also an efficient one. 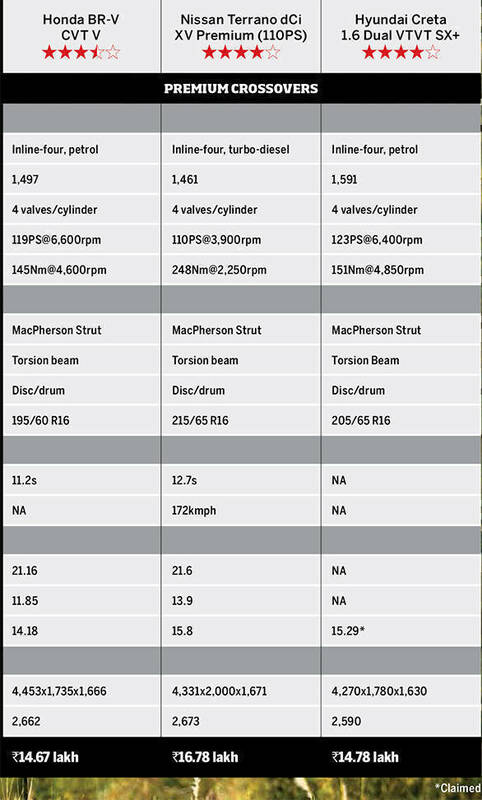 The Terrano's suspension, meanwhile, is set up to offer a perfect balance of excellent ride quality and good handling. Over the rough sections, I could confidently keep the throttle planted without being thrown around or having to worry that I'd break something. And with a more road-biased torsion beam set-up at the rear instead of the TUV's stiffer multi-link suspension, it didn't skip or hop around on uneven roads either. At the same time, the Terrano would happily encourage you to push it around the corners. It doesn't stay as flat as the Brezza, but for a car that's as comfortable as this is, handling is very impressive. That said, the steering could have done with a bit more weight at speeds above 120kmph. My biggest issue with the Terrano, however, is that it feels very dated in terms of features. 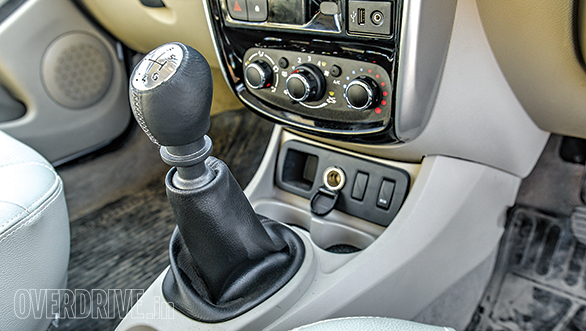 Like with the BR-V, it goes up against the well-specced Creta, and you still get mechanical features like a hydraulic steering instead of an electric one. Even the interior isn't as well-specced with just a basic analogue music system, and no automatic climate control. But like with the EcoSport, the Terrano is due for an update next year, and I'm certainly looking forward to getting my hands on that. 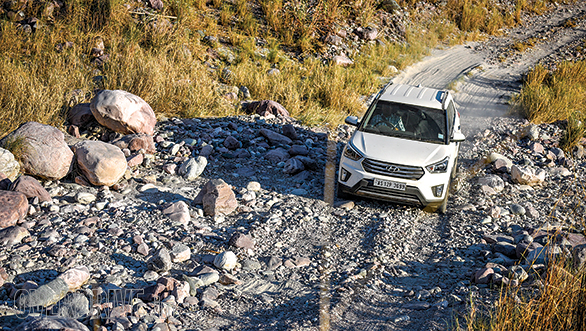 If I had to pick just one car to do it all  city driving, corner carving, long-distance road trips on the highway and occasionally on broken roads  I'd choose the Creta. When I stepped into the Creta after a long day of driving all the other cars, it immediately felt like a very nice place to be in. The car is well designed, handled the rough sections comfortably, the smooth roads even better, and generally felt more premium than all the other vehicles there. 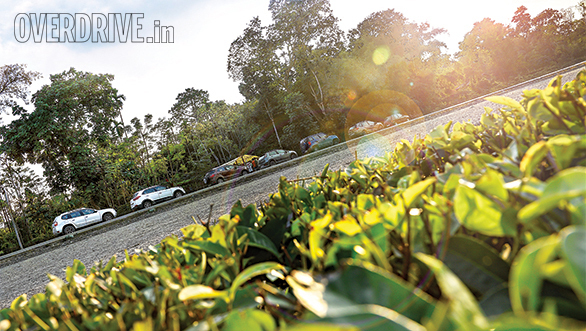 The Creta we drove ran the 123PS/151Nm 1.6-litre petrol unit from the Verna. Switch it on and the first thing you'll do is check if the engine is actually running. The engine is so refined that while idling, we could literally hear the crickets chirp outside. It's also quite a rev-happy engine, and the slick 6-speed transmission is geared perfectly to neither leave you bogged down at lower revs, nor wanting for a more relaxed cruise on the highway. The steering, although still a bit artificial, feels far better than the i20 Active's set-up. 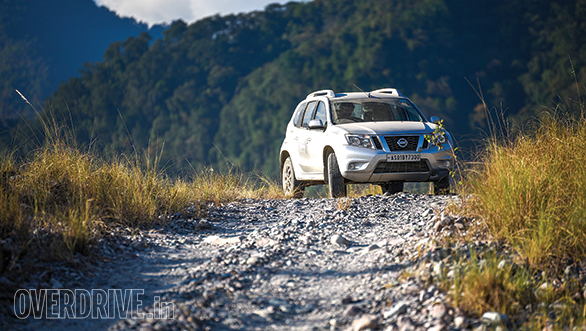 Like with the Terrano, the suspension is set up perfectly to offer good ride quality and handling. 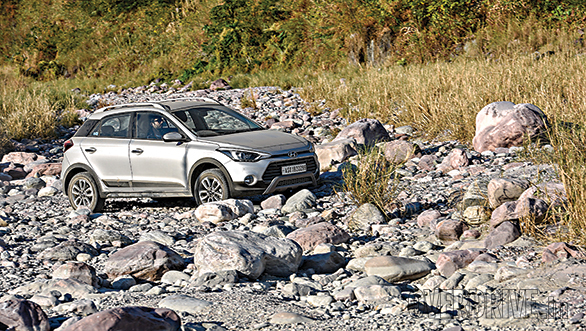 Over the riverbed, the Creta felt supple enough to get me through comfortably, with impressive damping to ensure I wasn't being thrown around. However, it certainly isn't as rugged as the Terrano and doesn't feel as indestructible. Which means I wasn't as carefree as I was in the Terrano while driving over the very rough sections. The fact that there are three different segments of cars in this test means it wouldn't be fair for me to pick just one overall winner. But with the unbiased baseline provided by the CEAT Tyres we used, I can pick four different winners, not based on their segment, but by their abilities and what they have to offer. 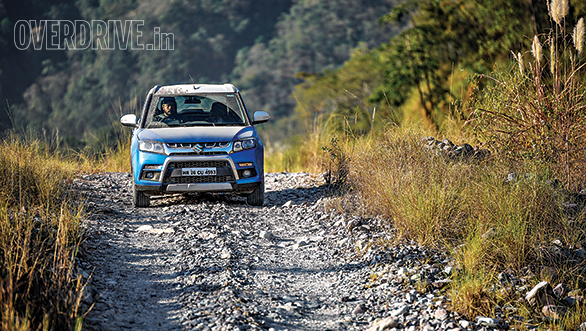 The winner of the first category, the best driver's car, would undoubtedly be the Vitara Brezza. It's easily the most involving car to drive here with its strong engine and excellent dynamics. It'll also take you to places like Dambuk and back without any complaint, albeit it won't be the most comfortable option. Essentially, it's great on the good roads and will survive the poor ones. Which brings us to the next category  the toughest-built crossover. This was a close call between the Terrano on the TUV300. Both are equally rugged and are ideal for the roughest Indian conditions. But I'm going to have to hand this one to the Terrano because it not only rides better than the TUV300 but also doesn't compromise on handling and stability. It's also considerably quicker and more enjoyable to drive. However, if I didn't have to deal with terrible roads and rough terrains on a regular basis, then the current-gen Terrano still wouldn't make the cut for me because of how dated it feels. If I had to pick a vehicle that felt most premium and didn't compromise on performance, comfort or driveability, it would be the Hyundai Creta. However, what it does compromise on is features and doesn't feel like the best value for money. 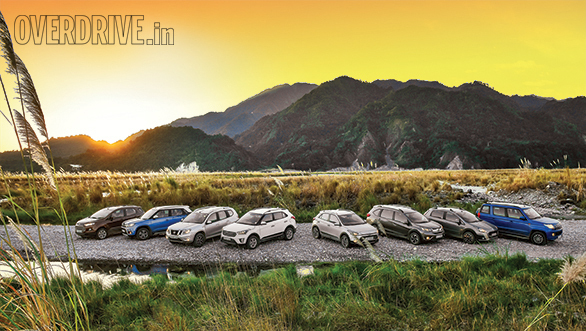 The approximately `2.80 lakh cheaper i20 Active and Vitara Brezza offer more creature comforts than the Creta. But between the i20 Active and the Brezza, it's the latter that makes more sense with its all-round capabilities. It was quite evident right from the start that the i20 Active and Avventura Urban Cross wouldn't trump the other, more capable cars in this test. But that wasn't the point of taking these cars along in the first place. We wanted to find out if these hatchbacks with their raised suspension were capable enough to keep up with the bigger crossovers in this test. And they did. They may not have been as happy in this terrain as the other crossovers, but they took it on anyway and made it to the other side.